Did you start off 2019 with plenty of good intentions? You probably meant to work smarter, be more focused and pro-active, set goals and so on. Here we are, one month in, and all that positive mindset is waning away in the harsh light of wintery mornings and traffic jams. It’s difficult to be focused if your work environment is not inviting. It’s time to stand still, take a look around you and think, what can you do to make your office a nicer place to be? Let’s take a look at your desk first. You probably spend more time here than you do in your own living room – but you don’t have dirty cup rings on your coffee table, or pens, staples and paper clips littering the floor at home, do you? Invest in some funky desk tidies and some bright coloured note pads. There’s a reason why so many people love stationery – it just helps you feel organised and inspired to achieve things. 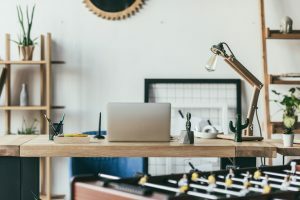 Introducing some order to your desk will make you feel more in control of your space. 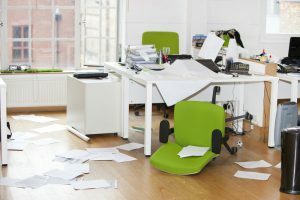 Whether your office is lucky enough to have a cleaner or not, there are still plenty of places they miss – including your keyboard and telephone. We don’t want to freak you out, but your keyboard can hold more germs than a toilet seat. Just think of all the crumbs you drop on there and the things your fingers hold and touch before you start tapping away, and you’ll have the wet wipes out in no time. Give your telephone a wipe too, particularly on the mouthpiece; polish your computer screen and wipe over the desk. You’re already finding your work space a little more welcoming. Now your desk is nice and tidy, take a look around the room itself. You might not have a huge amount of control over your environment, but we’re sure there are some simple things you can do to cheer the place up. If you’re looking at a wall, pop up some inspirational posters. Tidy your notice board, taking down the information about last year’s Christmas party. Plants are a lovey way to brighten up your office space – and they have the benefit of adding more oxygen to the room, which improves your concentration. But if you are not green fingered, even some artificial plants can add colour. Take a look at how the space in your office is used. Open plan offices tend to be a little tidier, as you need to keep pathways clear, but old computer parts, spare chairs and marketing banners still build up around the edges. That’s the sort of thing that can go into storage until you need it. As for paperwork – well, that’s the bane of every modern office. It starts with one file tidied to the top of a cabinet, and before you know it that file has grown into a pile that leans like the Tower in Pisa. Stacks of paper multiply overnight in the corners and begin creeping their way off shelves and onto the floor. Do you really need all that paperwork? In many cases you have to keep documents, particularly if your industry requires storing customer data for any length of time – but you don’t actually need it to hand. So, consider archiving options. All you need is some nice strong boxes, some sort of numbering system, and a handy collection service with a strong back and a van, ready to transport it from your office to your very own indoor, prepared secure storage unit. Now that’s all out of the way, look at the wonderful space you have left. There’s enough room for a comfy sofa, or a new coffee machine. You could fit in a meeting space for clients – or how about a table football game for the team. Don’t languish away in an unwelcoming office – we’re right here with our strong backs AND IN-HOUSE COLLECTION TEAM, ready to help you make your space work better for you.